So, the first episode was just a preparation for a flashback after all. I know I expected this to happen, but I was still kinda hoping it wouldn’t slow down like this. Either way, this episode as a true introduction to the series. I’m not entirely sure what to make of this Azuma Kyoutarou character…he seems way too calm about things and I’m suspicious about why he doesn’t show up in the first episode (or maybe he was and I didn’t notice). It’s a strange situation, this whole thing of floating fish and psychic powers. It begs the question of why this phenomenon is occurring and why it has exactly this timing. Do all the powers spawn at about the same time? And if not, why isn’t this much more widespread? There seemed to be quite a lot of fish flying around. 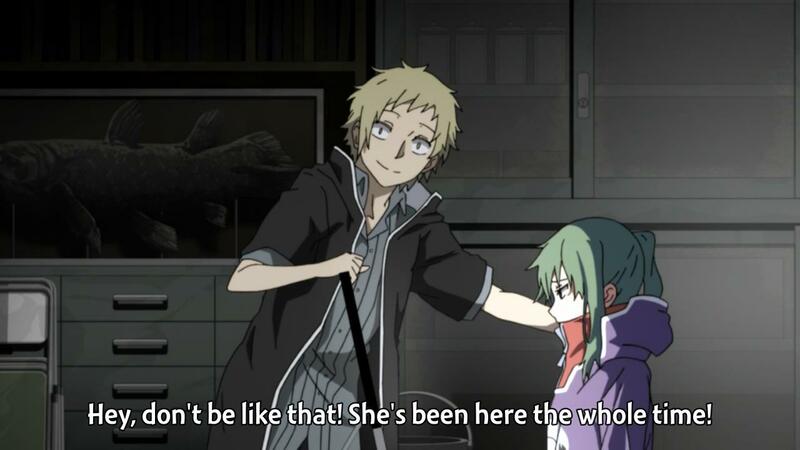 Mekakucity Actors Episode 8: A new ally? It looks like we were able to learn a little bit more about the origin of the psychic powers everyone has this week. Also, there’s a new guy starting to gain his own power. This show jumps around with different people’s stories so much that it’s hard to keep track of what’s happening to each person. The preview suggests that next week’s episode will jump back to Ayano. I’m curious what actually happened to her. Did she get swallowed by the void in a near-death experience that was aimed at manifesting her powers? Or maybe Shintaro actually has a power and she was the necessary sacrifice to the void (the other characters seemed to always have someone else with them when they developed their power). 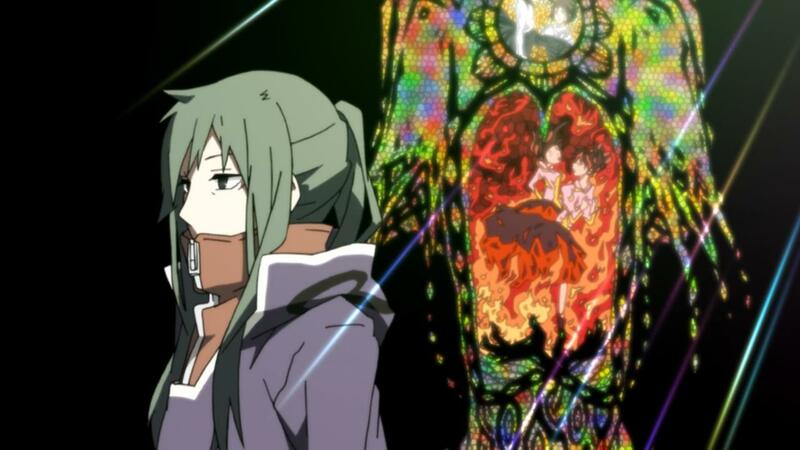 Author marthaurionPosted on June 3, 2014 Categories Mekakucity ActorsTags kagerou daze, psychic powerLeave a comment on Mekakucity Actors Episode 8: A new ally? It looks like we might have an antagonist…or at the very least, the source of everyone’s powers. This mysterious teacher seems to be, at the very least, the source of Ene and Konoha’s current condition. But why is he doing this? Is he secretly trying to help him or does he have some sort of grand master plan? There are still some pieces missing. Anyway, I’m not entirely sure what to expect next week. Apparently Shintaro has a friend that’s been hospitalized. Online buddy? Maybe they’ll go more into everyone else’s past. Their conditions all seem to be linked somehow. Although, the title of the next episode suggests that they might go into Konoha or something (presumably he has none of Haruka’s memories). This week we meet the human form of Ene as well as the Ayano that was mentioned at the end of last week’s episode. It also looks like Shintaro also knew Ene before she became a program in his computer. Seems like Shintaro has always been a charmer with the ladies. So, this story isn’t quite over. 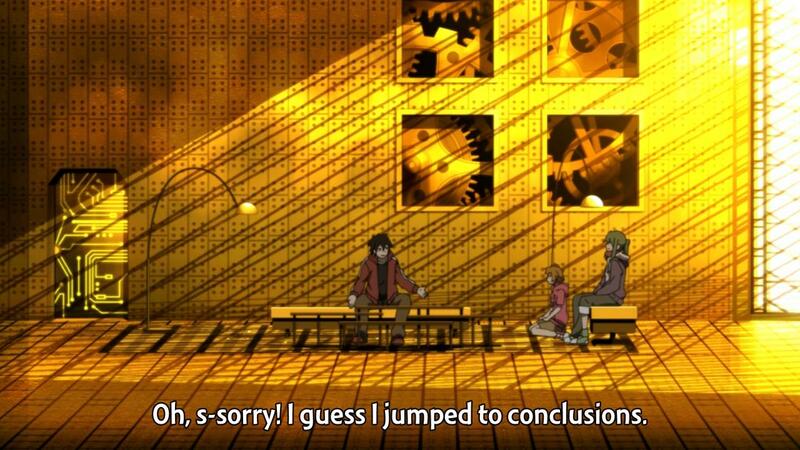 We know that Shintaro becomes a shut-in, Ayano dies, and Ene becomes a program. So what is the missing link that causes all of this to happen? I suppose Ayano’s death could lead Shintaro to shutting himself in his room as they seem to be friends, but what causes Ene to enter his computer? Is Ene a copy of Takane’s personality or is she actually Takane? Mekakucity Actors Episode 5: The leader! Wait, the boy and the girl from last week are still alive? Isn’t one of them supposed to be dead? Well, it looks like neither them are as important as Konoha, who will probably join the main cast. I’m not sure what to make of his power. Is it just a self-enhancing power, or is that taking it too literally based on what was shown this week? Anyway, it looks like Ene is acquainted with the former leader of the Blindfold Gang somehow. 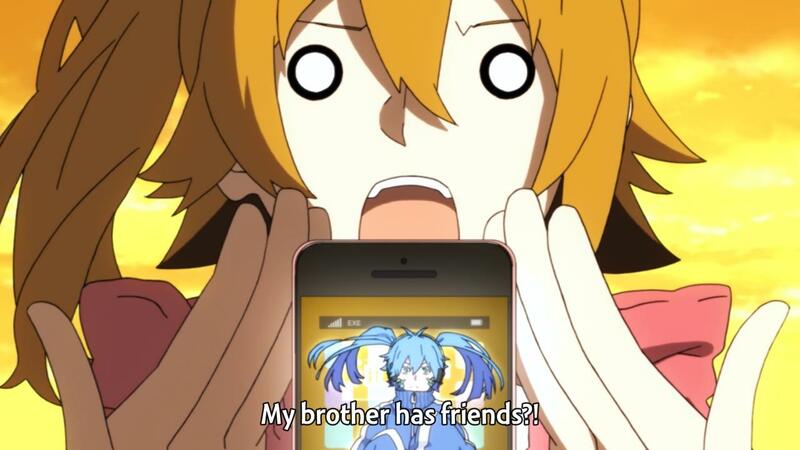 Maybe that’s the mysterious creator and her death was the trigger that lead Ene to Shintarou in the first place? Also, who was that pictured at the very end of the episode in the “preview”? It looked like a more-human Ene. Is that supposed to suggest that she was originally human? Maybe we’ll find out next week if she’s starting to remember this Ayano person. Author marthaurionPosted on May 13, 2014 Categories Mekakucity ActorsTags kagerou daze, psychic powerLeave a comment on Mekakucity Actors Episode 5: The leader! This week’s episode introduces the sister, Kisaragi Momo. This is the part where the supernatural starts to make its appearance, as Momo has the power to attract the attention of those around her. I assume this power is similar to being able to see the future in that it makes your accomplishments seem more trivial. I didn’t get too far in the manga for this show, so I think I only know what happens up to the next episode. Next week is the recruitment episode where Momo finds more people like her. That being said, not much is known at that point what the direction of the show is and what exactly the meaning of these powers is. You know…this motif that government researchers are cruel, heartless people is a bit annoying…it’s possible to perform research outside the range of ethics without becoming a raging psychopath. But that’s beside the point. I find the method they came up with to artificially create powers pretty funny…let’s put kids in buckets and hook them up to people. As far as I can tell and as far as I can remember, this show has been pretty faithful so far to the manga. Still early, I guess. I remember the next part, though…the bit about the Lost Ones…it’s actually kinda funny. 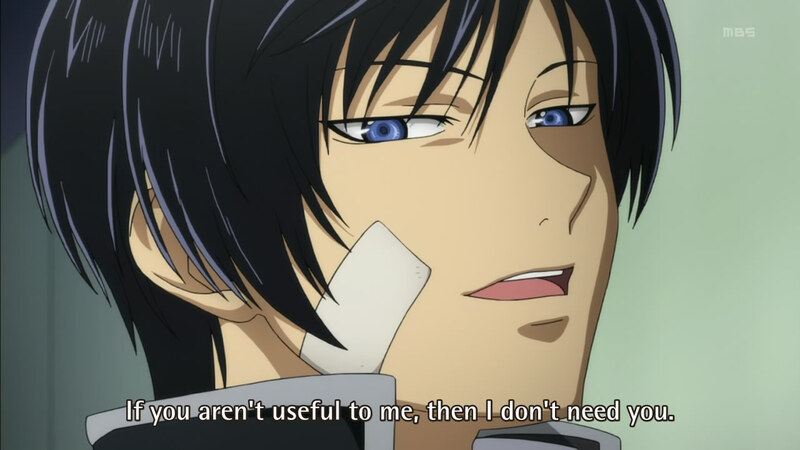 Have to make sure that people with psychic powers can’t be too overpowered, right?